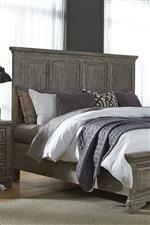 This large chest presents extended storage for your bedroom setting. Featuring two English dovetail drawers with metal glides, the chest showcases two large doors with panel accents. Completed with a gravel finish, the chest rests on sturdy bracket feet. The Highlands Door Chest with 2 Drawers by Liberty Furniture at A1 Furniture & Mattress in the Madison, WI area. Product availability may vary. Contact us for the most current availability on this product. The Highlands collection fuses transitional design with rustic style elements to create exceptionally accommodating bedroom furnishings. 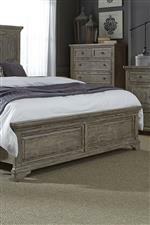 Crafted from Spruce Pine solid wood, the pieces feature English dovetail drawer construction with full extension metal side glides, antique pewter knob hardware, fully finished drawers, bed storage, and other amenities. Well-crafted and completed with a Gravel finish, add transitional elegance to your home with these wonderful bedroom furnishings. The Highlands collection is a great option if you are looking for furniture in the Madison, WI area. Browse other items in the Highlands collection from A1 Furniture & Mattress in the Madison, WI area.